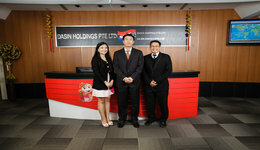 Dasin Shipping Pte Ltd is set up as an in-house ship management arm of Dasin Holdings Pte Ltd. The Company has obtained a DOC certificate issued by the China Classification Society (CCS) and is put fully in charge of the management and operations of Dasin Holdings’ vessels. Dasin Shipping comprised of the following departments: Shipping, Technical, Operations and Crewing. At present, it manages a total of 20 Supramax bulk carriers engaged in worldwide trade. The Company pays great attention to ensure safe sea carriage of our charterers’ cargoes and is made up of a team of highly qualified and specialized personnel. For 23 years, the vessels under our management have been plying all over the world, sailing across all oceans and continents and have safely called at more than 180 ports from over 60 countries. The Company, with its massive international network, has attained world class standards in our ship management services and accumulated extensive managerial experience to become one of the more influential Chinese enterprises in Singapore. With the adoption of a new corporate image, the company prides itself on delivering excellent services and aims to jointly create a better future with our partners from all over the world.